I was letting Igor out for his morning romp, and these caught my eye from the front deck where I was sipping my morning tea. I could see them in the woods behind the shed, standing tall in the early morning sunlight. I ran and grabbed my camera and took this picture, and they were so lovely, I had to post them. 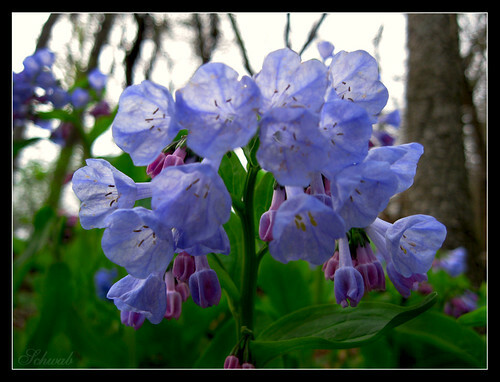 This flower has been identified: mertensia virginica (L.) Named after German botanist Franz K. Mertens. I took this shot in early morning light, with my Canon Powershot A1000 IS, no flash. Igor wandered off on a deer hunt, and didn’t return for 20 minutes. I was livid. In my search, I found Bo Mackison’s photography and was captured by the beauty of nature which was captured. I finally got to view the pictures I took while in Indiana 2 weeks ago…wow has it been that long already? I still need to work on my photo-techniques, but that will come with time. Turtleback Sweater Yarn ordered, whoohoo!! I’m still working on my Basketweave (basket-case) Washcloth, going to make it a small hand towel, I am finally getting used to this pattern at the 5th repeat……sheesh! Mom and I got to sit and knit and chat a while. The folks came bearing gifts for my birfday :heart: Mom got me a knit fingerless glove/wrist warmers kit, with some yummy Baby Alpaca yarn in a soft blue, nice! I fell in love with the feel and color when Bonnie and I were shopping there this past weekend. 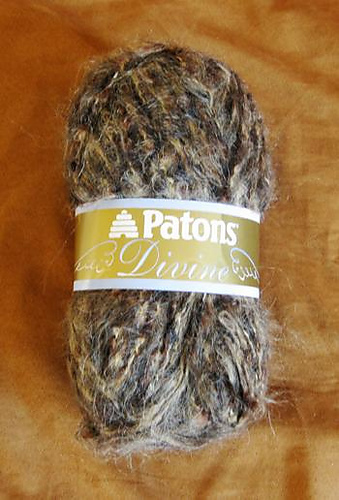 I am not good at picking out yarns online, I have to feel what am getting. Today I opened a couple windows upstairs. It was pretty warm upstairs, but by the time the rains came, it was already cooling down……so closed them again, and now it’s stuffy.. Tomorrow I bake, try to call Christy and rest…I can’t believe how wiped out I got from not having a weekend to recoup…I’m such a creature of habit, but would gladly do last weekend again! Got to get some Mikey-Time, have a lovely Sunday! We’re back from our trip, what an adventure! Grandma Broken Nose and Baby Rhonda, now at 6 lbs! Had an uneventful ride down, road construction was as expected-never-ending concrete dividers for miles and 45 mph almost the entire stretch from Gurney to Cline Rd., a break from Cline to where 80 leaves off 65, then more of the same into IN to nearly Lowell. Nats got to drive from our house to 294 onramp to Chicago, then I took the helm. I finally got a break in IN when we hit Lowell, and she got to drive for about 1.30 hours. It was pretty busy, a Thursday, probably like most, but with Easter Sunday looming large on the horizon. We got in at around 3:30pm and went straight to Christy and Ryan’s house to rest up. Nats got to hold her new Niece for about 40 minutes before her dad arrived to whisk her off for dinner. A little later, Ryan, Cj and I took Baby Rhonda for a car-ride- she was a bit fussy with colic, and on a little side trip around Greenwood at around 7, we stopped and ordered a pizza for delivery. I wanted to get a bottle of wine at a liquor store in the shopping plaza we were at, but they didn’t have either of my favorites, Turning Leaf White Zin, or Tisdale, “mighty fine wine for $2.99” owell, I managed to bust my nose on CJ’s car door getting back in the car. (*you can barely see the band aid on my schnoz in the picture of me holding Baby Rhonda) nice going, Sandra. We spent the night at Bonnie and Danny’s, and I got to visit with their next-door neighbor Sheila, a good friend from my days living in the ‘Hood. Danny’s sister Cathy came over to visit too, and we had a great time just sitting around the kitchen table catching up on neighborhood news. There was a dismal air that seemed to hang over the area, since last years floods whipped out many homes on their street; many homeowners did not return, leaving houses to neglect. Saturday night, Christy and Ryan had Rich and Dena and the kids over. Bonnie, Danny and Mary came also, as well as Ryan’s mom Pat. It was great to see her again! We had a quick breakfast of donuts and coffee and headed out about 8:15am, I had already gassed up the night before. We pulled into Elkhorn at right at 2pm and got ready for the Poodle Attack! Igor was beside himself-there were two of him it seemed, as he raced alternately between me and Nats and couldn’t make up his mind who he was happier to see! When Mike got out the last of our treasures from the back of the Blazer, Igor promptly jumped into the back and sat as if waiting for his Car Ride. I had to coax him out with the promise of biscotti, and only then did he get down and follow us back inside, only to rain more kisses upon me than I think I’ve ever had before! Mike was very obviously worn out from his bachelor weekend, and was definitely happy we were back.